Two maps on one sheet. The left side of this lovely double map features an uncolored chart of the St. Lawrence River in two parts, flowing its entire course from Lake Ontario to Montreal and on to its mouth. The map also depicts a portion of Lake Champlain and the Richelieu River. The larger map of the two is a fully colored map of the United States extending from Maine and the ‘Western Territory’ in the north, as far west as just beyond the Mississippi River, and as far south as midway through Florida. Maine is depicted here with British boundary claims and Georgia is shown with its western boundary extending all the way west to the Mississippi River. Florida at the time was divided into East and West (the panhandle). Bounded by the Ohio River, Canada and the Mississippi River, the enormous Western Territory includes today’s Minnesota, Wisconsin, Michigan, Illinois, Indiana and Ohio. Thomson names Indian tribes and their territories, and shows a route for navigating the Great Lakes. Other items of particular interest include notations concerning the navigability of rivers such as the Mississippi, which has details such as ‘low swampy land’, ‘here the river is a mile wide’. Similar notations in other parts of the country provide useful information regarding topographical features. 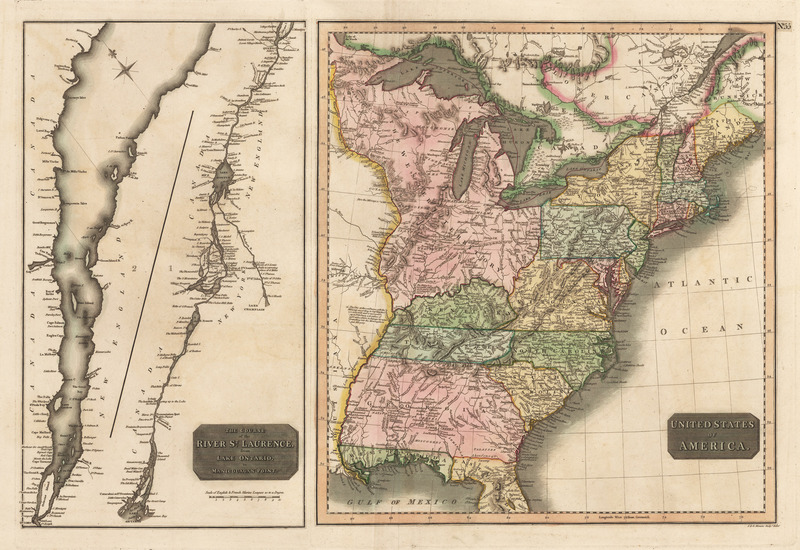 Condition: This map on high quality paper is a strong impression in A condition. A very minor imperfection has been repaired with archival material on the verso. Toning is even.